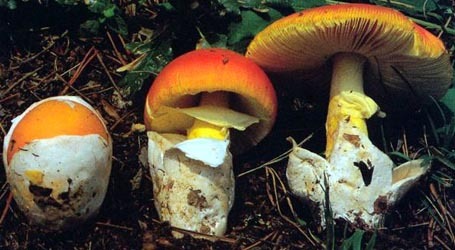 english name "Flame-Colored Ringless Amanita"
1. 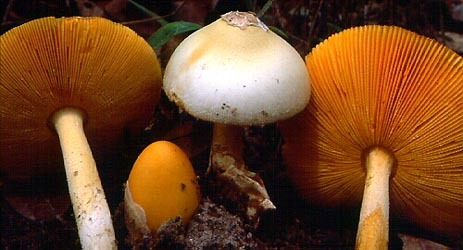 Amanita flammeola, east-central Africa. The cap of A. flammeola is 60 - 90 mm wide, narrowly rounded-conic at first, expanding to applanate with decurved margin, umbonate, margin striate (10 - 15% of the radius); it is saffron yellow, straw yellow at margin, becoming paler with age. The flesh is fairly thick, firm, and white. The volva is absent. The gills are free, crowded, and saffron yellow or paler. The short gills are truncate, common, unevenly distributed, of at least three lengths. The stem is 60 - 150 × 5 - 20 mm, narrowing upward, and exannulate. The volva is subcylindric, sac-like, and up to 60 mm tall; it is white, membranous, with a thick exterior surface layer appearing to be delaminated. The spores measure (8.6-) 10.5 - 13.3 (-15.4) × (5.7-) 6.3 - 7.7 (-9.0) µm and are ellipsoid to elongate (rarely cylindric) and inamyloid. Clamps are were not observed at bases of basidia. The species was originally described from Zambia and is known from central Africa. author Pegler & Piearce. 1980. Kew Bull. 35(3): 482, fig. 3(A-D). MK277533 nrLSU 14-24.xii.2000 David Arora 00-326 (RET 346-5) L. Nagy, Agaricales Diversification, Szeged Univ. intro The following text may makes multiple use of each data field. The field may contain magenta text representing a type study by Tulloss. The same field may also contain black text, which will represent a revision of the species by Tulloss. Paragraphs of black text will be labeled if further subdivision of this text is appropriate. The following is based on the protolog (for most macroscopic data) and on original research of R. E. Tulloss. pileus from type study of Tulloss: 60 - 90 mm wide, saffron yellow, straw yellow at margin, becoming paler at maturity, narrowly rounded-conic at first, expanding to applanate with decurved margin, umbonate; context fairly thick [although very thin in exsiccata], firm, white; margin striate (0.1 - 0.15R), nonappendiculate; universal veil absent. lamellae from type study of Tulloss: free, crowded, saffron yellow or paler, presently somewhat pinkish brown in exsiccata, ventricose, with edge floccose-denticulate; lamellulae truncate, common, unevenly distributed, of three lengths. stipe from type study of Tulloss: 60 - 150 × 5 - 20 mm, concolorous with pileus, cylindric or narrowing upward, pruinose to farinose; context solid to stuffed (hollow in exsiccatum); exannulate; universal veil as cylindro-saccate volva, up to 60 mm tall, white, membranous, with thin exterior surface layer appearing to be delaminated from thicker and somewhat spongy interior in exsiccata, completely buried in substrate (despite its length), having longitudinally fibrillose pallid membranous limbus internus (1± cm high in exsiccatum, probably originally pale yellow to yellow) attached to volval limb about one-third of distance from base of stipe to uppermost point on limb. odor/taste from type study of Tulloss: Odor pleasant; taste mild. 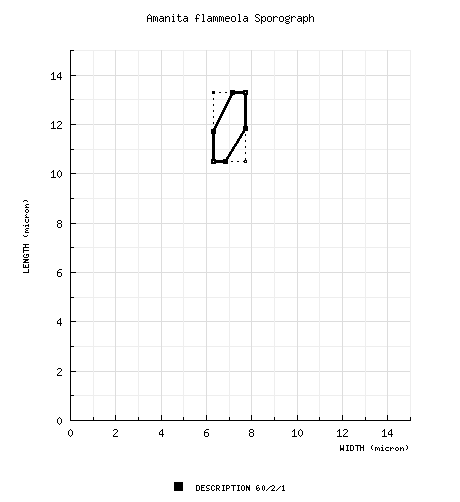 tests from type study of Tulloss: none recorded. EDIBLE. pileipellis from type study of Tulloss: suprapellis comprising sinuous, narrow, filamentous, undifferentiated hyphae in gelatinous matrix, 45 - 80 µm thick; subpellis comprising densely packed, ungelatinized hyphae, very faintly yellow, 55 - 185 µm thick; filamentous, undifferentiated hyphae in suprapellis 1.2 - 3.4 µm wide, branching; filamentous, undifferentiated hyphae in subpellis 2.0 - 8.4 µm wide, branching, subradially oriented, with intercalary inflated segments (up to 70 × 15.4 µm or larger), often slightly constricted at septa; vascular hyphae 1.5 - 6.3 µm wide, branching, apparently restricted to subpellis. pileus context from type study of Tulloss: filamentous, undifferentiated hyphae 2.8 - 11.3 µm wide, dominating, branching, interwoven in loose lattice, with those of smaller diameter often in fascicles, with those of larger diameter often constricted at septa, with plentiful partially inflated intercalary segments up to 18.9 µm wide; acrophysalides not observed; vascular hyphae 4.2 - 7.7 µm wide, scattered, infrequent. lamella trama from type study of Tulloss: bilateral, very poorly rehydrating in holotype; wcs = 35 - 40 µm; subhymenial base comprising branching short-segmented hyphae and subfusiform to narrowly ellipsoid inflated intercalary thin-walled cells (up to 50 × 16.8 µm) in chains or with single cell reaching from central stratum into subhymenium, with such cells or chains diverging from central stratum at at shallow angle (under 30°); filamentous, undifferentiated hyphae 2.1 - 5.6 µm wide, branching, occasionally with yellowish subrefractive walls, with intercalary segments in central stratum often partially inflated (up to 11.2 µm wide); terminal, inflated cells not observed; vascular hyphae not observed. subhymenium from type study of Tulloss: wst-near = 40 - 55 µm; wst-far = 65 - 70 µm; pseudoparenchymatous in many regions of most mature basidia, with 1 - 4 cells (hyphal segments or globose to subglobose to clavate inflated cells, 9.4 - 13.3 × 9.1 - 11.9 µm, thin-walled, with major axes perpendicular to central stratum) between bases of basidia/-oles and subhymenial base, with 2 - 3 cells between bases of longest and shortest basidia/-oles in selected regions of hymenium, with basidia arising (sometimes multiply) from inflated cells and (at least in less mature regions of hymenium) from partially inflated short hyphal segments. basidia from type study of Tulloss: (26-) 30 - 65 × (7.8-) 9.8 - 12.9 µm, 4-sterigmate, with walls 0.7± µm thick in apical portion, with sterigmata up to 5.7 × 1.7 µm; clamps not observed. universal veil from type study of Tulloss: On pileus: occasional pale yellow gelatinized patches of co-parallel hyphae in layer one or two hyphal diameters thick. On stipe base, exterior surface: filamentous, undifferentiated hyphae 2.1 - 7.7 µm wide, branching, with those of larger diameter constricted at septa, colorless, in very broad fascicles with diverse orientations (although many sublongitudinally oriented), often partially gelatinized [and then often encrusted with yellow material (from substrate?)] and/or partially collapsed; inflated cells and vascular hyphae not observed. On stipe base, interior: filamentous, undifferentiated hyphae 2.0 - 10.5 µm wide, branching, dominating, in fascicles and singly, occasionally with pale yellow walls, more commonly pigmented near inner surface, more likely to be sublongitudinally oriented near surfaces, otherwise without dominant orientation and interwoven in open lattice; inflated cells not observed; vascular hyphae 2.1 - 10.8 µm wide, occasional, observed only near inner surface. On stipe base, inner surface: partially to strongly gelatinized, otherwise as described under interior. On stipe base, limbus internus: longitudinally acrophysalidic, completely ungelatinized; filamentous, undifferentiated hyphae 1.4 - 8.4 µm wide, branching, frequently having yellow walls, with those of larger diameter often constricted at septa, with infrequent inflated intercalary segments (up to 12.6 µm wide), with plentiful tip cells; acrophysalides unevenly distributed, most frequent in uppermost portion of tissue, up to 115 × 28 µm, thin-walled, clavate, occasionally with yellow walls; vascular hyphae not observed after extensive search. stipe context from type study of Tulloss: longitudinally acrophysalidic; filamentous, undifferentiated hyphae 1.8 - 7.1 µm wide, branching, plentiful, dominant at surface; acrophysalides plentiful to dominant away from surface, thin-walled, up to 176 × 22 µm; vascular hyphae 2.0 - 8.3 µm wide, branching, scarce in interior, scattered (but locally rather frequent) at surface. from type study of Tulloss: [60/2/1] (8.6-) 10.5 - 13.3 (-15.4) × (5.7-) 6.3 - 7.7 (-9.0) µm, (L = 11.5 - 11.6 µm; L’ = 11.5 µm; W = 6.8 - 6.9 µm; W’ = 6.9 µm; Q = (1.39-) 1.54 - 1.86 (-2.05); Q = 1.68 - 1.69; Q’ = 1.69), hyaline, colorless, thin-walled, smooth, inamyloid, ellipsoid to elongate, infrequently cylindric, often adaxially flattened, sometimes expanded at one end; apiculus sublateral, subcylindric to truncate-conic, short and relatively broad; contents dominantly monoguttulate, occasionally multiguttulate; very pale salmon pink in deposit. ecology from type study of Tulloss: Solitary in miombo woodland, in December and from late March to early April. RET: In mixture of Uapaca and Brachystegia. material examined RET: ZAMBIA: COPPERBELT PROV.—ca. Kitwe, Garneton, 14-24.xii.2000 David Arora 00-326 (RET 346-5, nrLSU seq'd. ); btwn. Kitwe and Ndola, purchased by roadside, 22.xii.1978 G. D. Piearce FP 602/2 (paratype, K); off Kitwe-Ndola Road, Greystone Farm, 28.xii.2000 David Arora 00-465 (RET 348-4; SFSU); Misaka Nat. For., 28.xii.1978 H. Munthali s.n. [Piearce FP 605] (holotype, K). discussion type study of Tulloss: The pileipellis of A. flammeola is of a form very uncommon in the taxa of section Vaginatae that I have reviewed to date. The only somewhat similar pileipellis was seen in A. dunicola Guzmán (Tulloss 1994: 310) and A. sampajensis (this site). The suprapellis may fit the description by Shaffer (1966) of a pellis in which a gel is secreted by hyphae that themselves are not gelatinized—rather than produced by the swelling and breakdown of hyphal walls, which is the usual case in Amanita. The paratype collection (Piearce FP 602/2) is immature. Its lamellae bear very few mature spores. However, the unusual pileipellis, thickened apices of basidia, macroscopic similarity, etc. are convincing evidence for conspecificity. Sterigmata and apophyses were beginning to form on numerous basidia when the basidiocarp was dried. The subhymenium illustrated (Fig. ??) is probably underinflated compared with what would be expected in a mature specimen. I examined spores from lamellae of the two mature basidiocarps of the holotype and from the spore print associated with the smaller of the two. In no case did I obtain data yielding a Q as high as that reported in the protolog (1.95). The data from the spore print was almost identical with the data from the lamellae. Pegler and Piearce (1980) recorded a name for this species among an indigenous people (Bemba) in Zambia—musholomwa. select a collection to review/add spore measurements..#785101. David Arora, #00-326, ZAMBIA, COPPERBELT PROV., ca. Kitwe, Garneton#785102. G. D. Piearce, #FP 602/2, ZAMBIA, COPPERBELT PROV., btwn. Kitwe and Ndo..#785103. David Arora, #00-465, ZAMBIA, COPPERBELT PROV., off Kitwe-Ndola Road, G..#785104. H. Munthali, #s.n.=>Piearce FP 605, ZAMBIA, COPPERBELT PROV., Misaka Na..#819209. David Arora, #00-326, ZAMBIA, COPPERBELT PROV., ca. Kitwe, Garneton#819210. G. D. Piearce, #FP 602/2, ZAMBIA, COPPERBELT PROV., btwn. Kitwe and ..#819211. David Arora, #00-465, ZAMBIA, COPPERBELT PROV., off Kitwe-Ndola Road,..#819212. H. Munthali, #s.n.=>Piearce FP 605, ZAMBIA, COPPERBELT PROV., Misaka ..